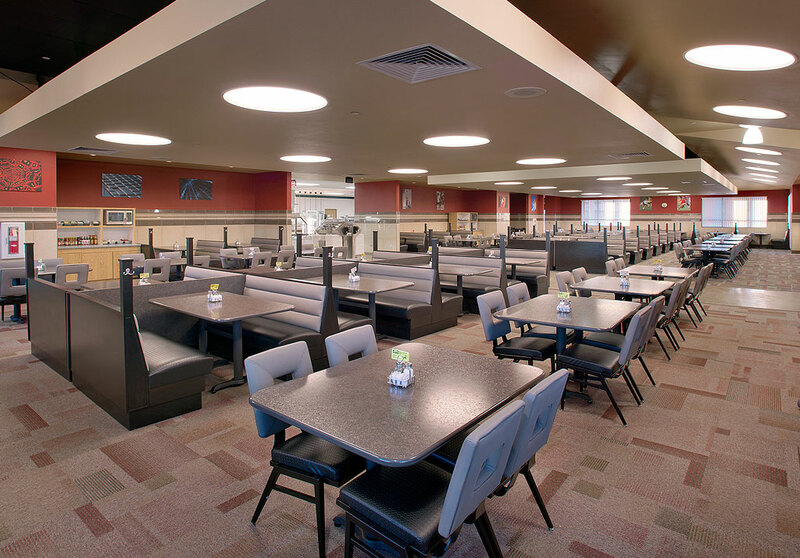 Cressman Dining Facility - PRIME AE Group, Inc.
PRIME provided full design services, including interior design, for renovation and repair of the kitchen, dining area, lobby and restrooms of the Cressman Dining Facility. The facility had extensive corrosion damage to structural, mechanical, electrical, and plumbing components in the crawl space (a confined area, making both investigation and repair difficult) and in the partition walls. An extensive structural assessment was completed to determine the extent of corrosion damage to the structural members. Avoiding complete demolition, the team reinforced and restored structural members, the concrete slab, and metal deck to meet required loads. A new lightweight wall was constructed to the ceiling level to incorporate utilities within the void space. Mechanical and electrical systems were upgraded to support the renovated facility and remodeled interiors. Interior enhancements were made to modernize the dining environment. New flooring, glass block, porcelain tile wall surfaces, multi-level ceiling structures and new lighting were added. Interiors were designed to support a flexible, changeable seating arrangement.